The weather was beautiful yesterday so we went for a picnic. I packed a bento for Nikolai and some extras in our picnic basket for the rest of us. I saw and pinned this cute bunny in race car idea from Freefuneaster last year and thought that they were super adorable. My version is slightly modified. Race car made from hot-dog bun with marshmallows cut in half to form the tires which are held on with toothpick axles with a pretzel steering wheel and driven by an Easter bunny pick. Packed in a Trudeau fuel sandwich box. Cute lunch and what a great idea! 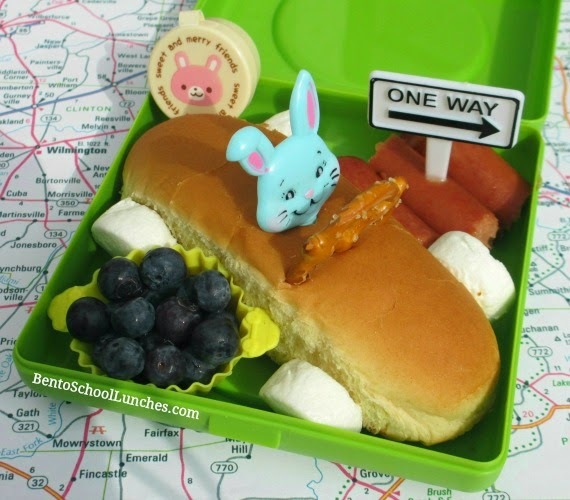 Very cute and creative bento!